Based on my observations in offices around the country, I’ve collected these real-life best practices to address three common client questions—which, in turn, will help you in effectively managing client expectations. You’re no doubt familiar with the old compliance adage, “Documentation is paramount.” Still, documentation problems remain a recurring theme during audits for many advisors, particularly when it comes to advisory accounts. It’s always important to ensure that you and your clients are on the same page by documenting everything you discuss. Before each face-to-face meeting, consider sending an agenda to your client that covers anticipated discussion topics and the paperwork he or she should bring to the meeting. You might also develop a questionnaire aimed at gathering up-to-date client suitability information. Once the meeting is concluded, the agenda and any notes from the conversation should be included in your client’s file. Do you have a registered assistant? If so, have him or her sit in on all client meetings to take detailed notes, which you can then use for review and comment. Be sure to upload these notes to your contact management system. A detailed postreview summary letter is a useful means of summarizing your client meetings. Each summary should cover three topics: what you discussed, what your client discussed, and follow-up from the meeting. These types of letters can be maintained in your clients’ files as correspondence. For example, an office in Michigan sends its postreview letter to clients via registered mail and keeps the return receipt in the client file. The receipt serves as evidence that the client actually received the document, which can come in handy if issues arise later. Overall, I think you will find that these letters not only provide valuable insight into market conditions, but also allow you to offer clients an enhanced level of communication and service. Use a detailed flowchart to show the levels of information security. For instance, the chart could outline firewall, antivirus, and spyware protection, as well as various other security protocols, including encrypted e-mail. Have a staff member accompany each client to your personal office. Although this may seem like a simple practice, it reassures your clients that visitors don’t have unfettered access to file cabinets, fax machines, and the like. Encourage prospective clients to meet not only with you but with each member of the staff. Introducing clients to everyone with access to their information is a smart way to help quell clients’ security concerns. Plus, it’s a nice personal touch! Ensure that your reception area is staffed at all times. If third parties were allowed to stroll through the reception area and into the office, your clients might doubt your office’s security. Once again, what seems like a simple practice can go a long way toward reassuring clients that their information is safe. 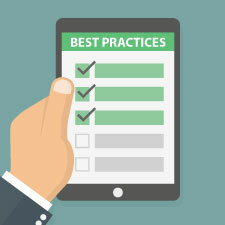 Of course, best practices will take your office only so far. Ultimately, it is your attention to detail and adherence to good compliance procedures that will help you mitigate risk and effectively manage your clients’ expectations. Although the practices I’ve shared won’t work for everyone, they may help provide a solid base for the future of your business—and ease your clients’ minds, too. What are some common questions that your clients ask? Have you used a postreview letter or a similar tool to manage their expectations? Please share your thoughts with us below.